In Liverpool music terms, the last weekend of May means one thing…. Liverpool Sound City. So there was only one place for Popped Music to head. Obviously. This year Sound City had moved from its previous home of Bramley Moore Dock to the larger surroundings of Clarence Dock. This may seem like a small change, but the difference put a lot more responsibility on the festival itself as they lost the big warehouse which had seen some special events make memories in just two festivals, I’m sure the brickwork must still have a tiny residual shake from the performance by Swans two years ago, let alone the raw punk of Fucked Up last year. In its place came a medium-sized traditional festival tent to accompany the Main Stage which was designed facing the city centre so that the audience were looking out to sea. It was also a bit uncoordinated in terms of what Sound City actually was. Was it the traditional style festival lasting two days? Or did it include the nostalgia nights of The Human League and John Cale performing The Velvet Underground? For Popped Music, life is all about new music so the first two nights were cast aside in order to save ourselves for the real Sound City Festival. 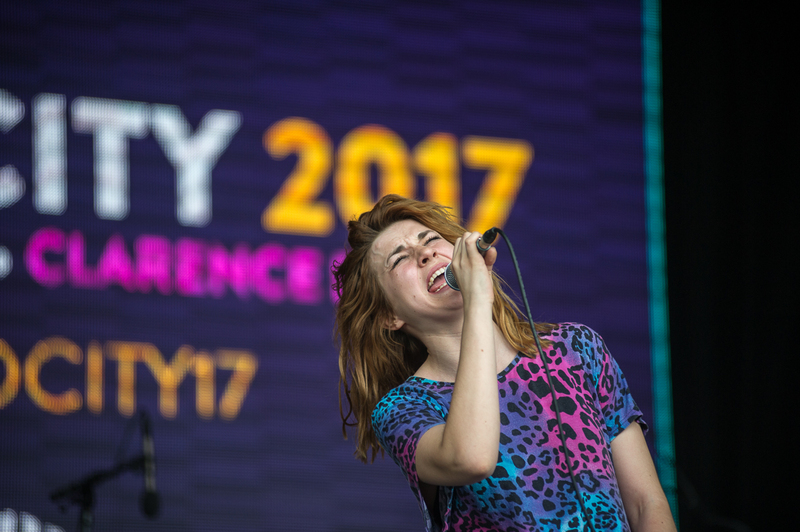 It was obvious that the organizers of Sound City had decided to go for a high energy start to the day with Estrons and Vant taking on smaller slots than you would expect them to play in order to get the main stage going. Unfortunately the crowd did not come through the turnstiles in enough numbers to thrive on the performances on offer at the largest space. But that did not stop the performers. In the tent we saw local band Generation produce a set of such energy that it made complete sense as to why my taxi driver dad text me about them the day before, “a recommendation from a customer”. I’ve seen the band before and love them, but hats off to whoever that passenger was for trying to educate my dad. Bad news, he hasn’t added them to his Kitchen Disco tracks. Despite threats of horrific thunderstorms and rain that would get Noah doing some carpentry, the site was bathed in sunshine from much of the early part of the day. Unfortunately the banks of the royal blue Mersey have a constant heavy breeze to minor gale 365 days per year. This meant that the industrial site became reminiscent of a small town in the Sahara desert as wave after wave of sand and dust hit the audience and bands. 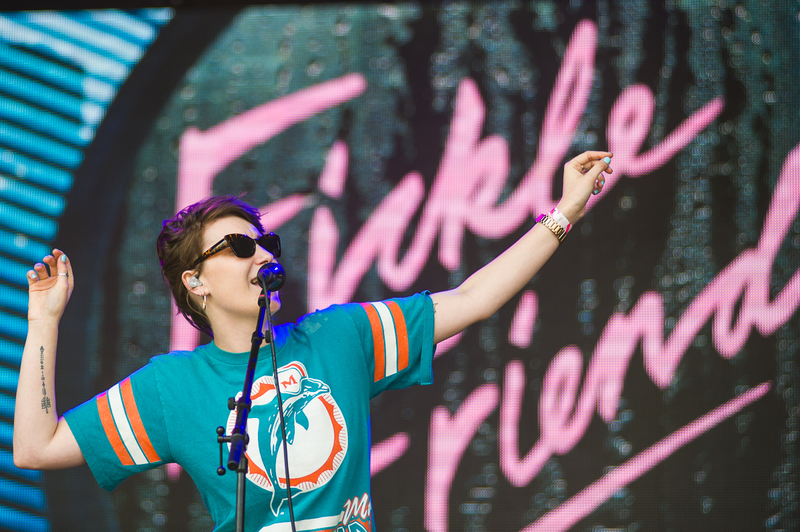 Fickle Friends were unlucky to perform in probably the worst of it which had Nattie complaining that “it’s been a bad day to wear white jeans” and after she took over keyboard duties during Say No More, “that keyboard felt like it was made of dust”. Hats off to the band though as these were only minor distractions and final track, Swim, felt victorious that they had succeeded. The regular sandstorm definitely took its toll on the audience though as The Hunna’s lively, energetic performance brought nothing but hoods up and coughing. It must be tough for bands when faced with such a trying set of conditions. At least when it rains people can put their waterproof jackets on and continue to enjoy themselves. The dust clouds were demoralising at times as grit hit your throat, teeth, and eyes. In the corner at Pirate Studios’ stage, there was less chance for the dust to build up momentum, however if it had tried during Bang Bang Romeo’s set then I think the power of Anastasia’s vocals would have sent the particles fleeing in fear for their very existence. By Jove! That girl has one hell of a set of lungs on her. Even if they had not been on my list of bands to watch, I would have had to watch them from the moment I heard her sing. Afterwards, I overheard somebody describing her as having the strength of Adele in her voice, but I would say it was more like watching a brilliant musical theatre performer as due to the range and pressure she put her voice under. I know that this meant that the rest of the band were somewhat overshadowed, but you wouldn’t tell John Squire not to do a guitar solo. 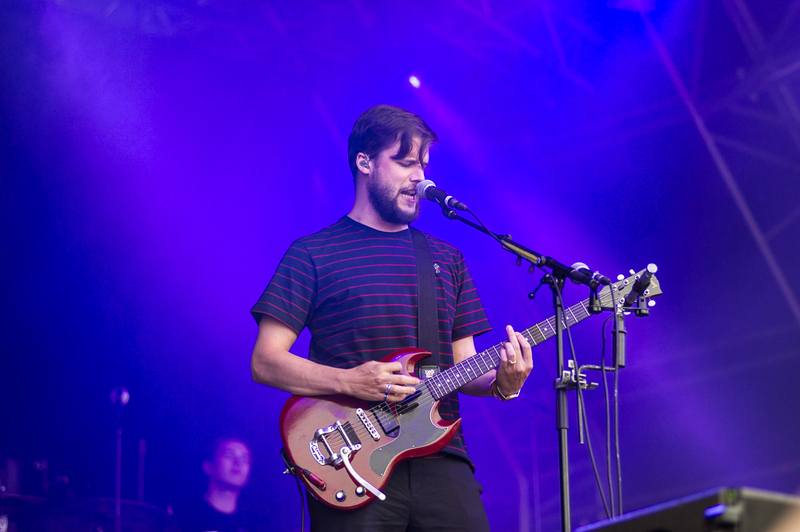 From the grandiose to the wonderfully simple, as a short trek across the site took me to the Baltic Stage’s tent to catch Irish punk band, Touts. If you have not heard them yet and like The Clash then I would suggest that you get involved ASAP. I loved the energy and aggression in the set which flew by in a matter of seconds. Their finale of Them’s Gloria was glorious, G-L-O-R-I-O-U-S, GLORIOUS! 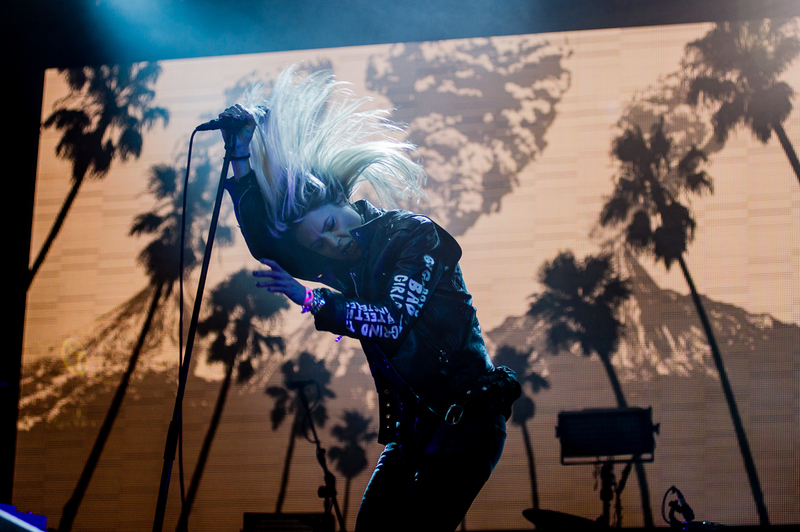 After the rough around the edges chaos of Touts, The Kills provided a beautiful contradiction to them without straying too far away. The Kills are a band who definitely divide opinion despite not seeming to be the kind of band who court hero worship or hatred. I can honestly say I would never choose to listen to them at home, but after watching them again I would actively go out of my way to watch them perform. There is an understated theatricality to their performance and sound. Maybe it could do with being even more ambitious, but The Kills make sure that you watch them on stage. It was obvious to me who the highlight of Sound City was going to be looking at the bill beforehand, and so it proved. 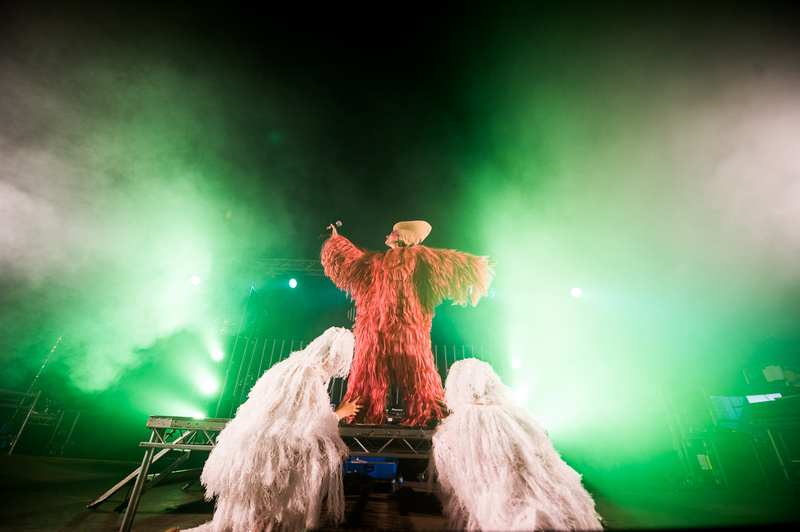 Peaches, Canada’s Queen of Electronica, had the Baltic Stage tent packed to the rafters with people before she filled it even further with beats, lights, costume changes, and huge inflatable genitalia. It felt like everybody at the festival was trying to squeeze themselves into the tent to throw their arms in the air, and unite in love of life and music. The tracks from Rub such as How Do You Like My Cut? 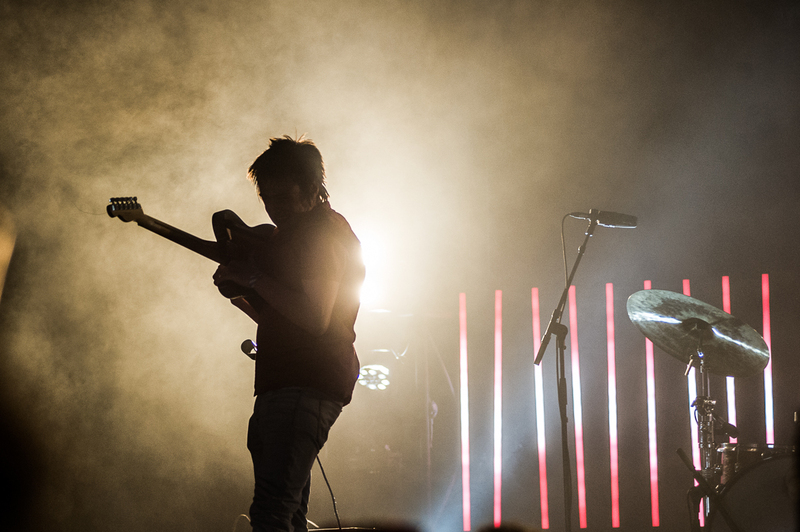 become rebel anthems in the warm, darkness of a venue. Peaches makes you feel that you could conquer the world. In addition to Sound City Festival, we also had the opportunity to go across the road to Invisible Wind Factory to take in some other acts. 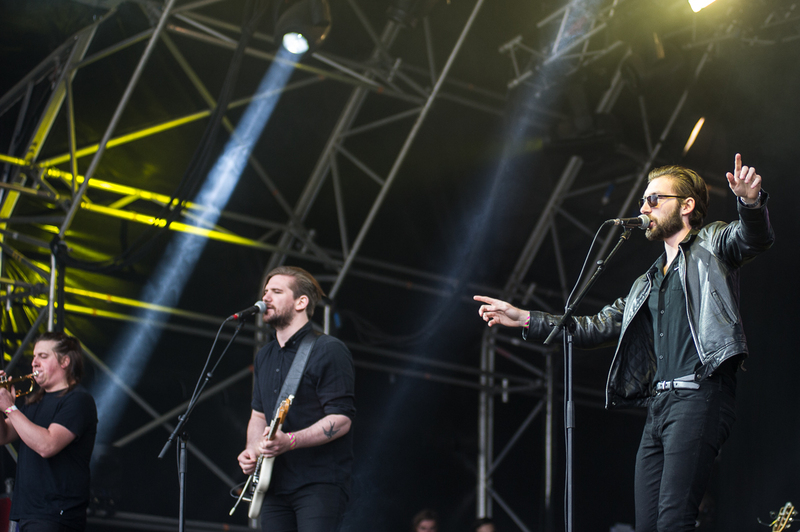 To be honest, it was like going back in time to the real Sound City when music would take over the city centre, and it was better as an event than the big stages and fairground on the waterfront. For one, Invisible Wind Factory got people nearer to each other and naturally encouraged more of a festival vibe as it felt impossible not to start making friends with people, or giving people you would have nodded to ten minutes earlier a big hug. Considering most people had been going for about ten hours at that point, you would understand if things become more chilled out, instead we had a shot in the collective arm from some high energy music acts such as Fling, Rongorongo, False Advertising (who had been stood behind me during Peaches and then rushed over to get ready for their set), and a smashing performance by Catholic Action around the corner at North Shore Troubador. Thankfully for the Sunday of Sound City, Saturday evening had finished with a bit of a downpour. This meant that the festival site was not going to be plagued with the sandstorms of the previous day, although the site was still pretty unforgiving underfoot. 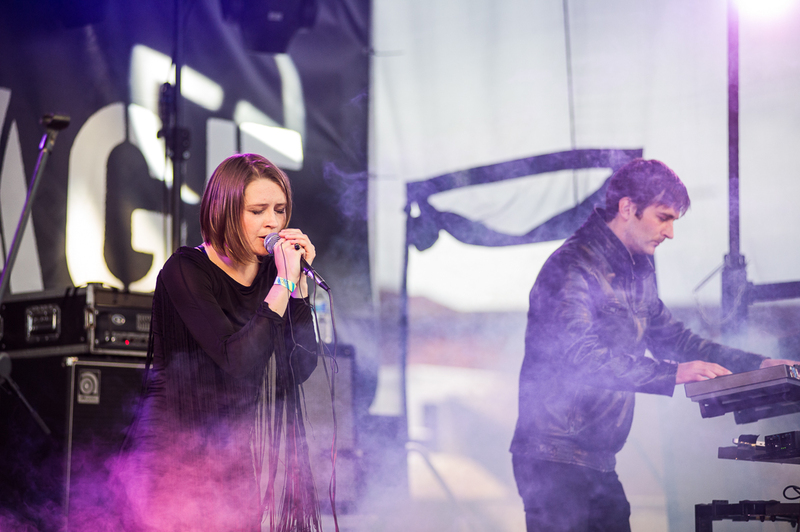 The stylish Red Rum Club opened up the Sunday’s party to thankfully a bigger crowd than Saturday. With smart songs and an effortless style when performing they did not drown on the big stage. Far from it. During the mid-noughties I sort of fell out of love with indie music, which meant the performance of Milburn did not hit any nostalgic notes for me; but they know their way around working an audience and if somebody in a band is confident enough in themselves to announce “We’re Milburn, we were even less famous about ten years ago”. I can understand that though as the older tracks seemed to me to be landfill indie as so many bands were described at the time, but there is a bit more of a swagger to their newer numbers. 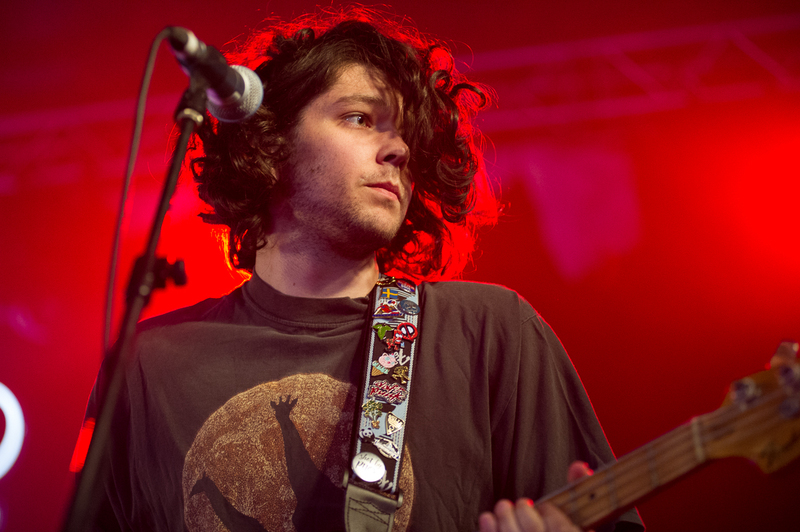 I can see throughout this summer that Milburn are going to be a crowd pleaser in a Maximo Park kind of way at a number of festivals. I won’t be looking for another stage if I happen to come across them again. Headlining the Atlantic Stage and closing the festival was another band from the noughties on a re-birth somewhat, The Kooks. 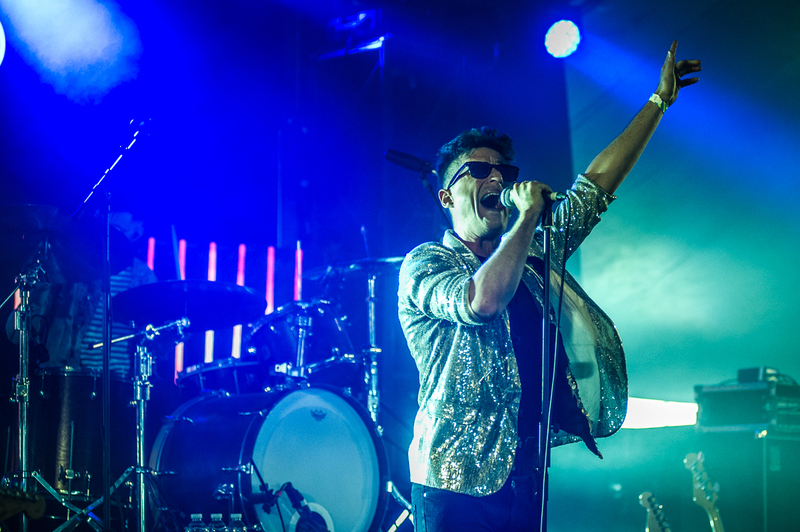 With a new found fan base due to Spotify playlists throwing up their indie classics for a new generation, it was a set people had been excited about all day long. 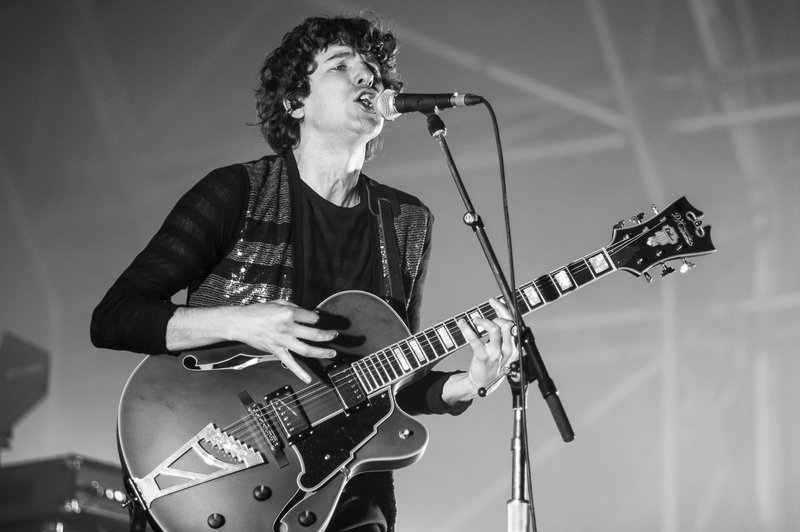 And The Kooks are a band who you can rely on to perform. I don’t like their music, but I still say their gig in the Bombed Out Church at Sound City 2011 was one of the best of my life for watching a band give it their all. Obviously circumstances were different then to now – for one the stage wasn’t made up basically of pallets – so it would not be fair of me to compare that intimacy with a giant industrial yard. But you are never going to be disappointed by a band who can hit you with tracks like Naïve and She Moves In Her Own Way. I might not like them, but they’re still brilliant floor filler indie disco numbers. And as the glitter cannons filled the air, you couldn’t help but be dragged along into the joy of The Kooks. It was a hard set for The Kooks too. It’d been a bit of a tough weekend for some of the audience because of the dusty air, but more pertinently prior to The Kooks’ closing the show, Liverpool and Manchester’s Metro Mayors had been out on stage to give a speech of remembrance and resilience against those who create terror which was followed by the playing of Don’t Look Back in Anger after an impeccably observed minute’s silence. If it had been a wilder or more somber band, then it might not have struck such a chord with the audience. Instead The Kooks were perfect in their moment. In the slot before the headliner, came one of my favourite bands of the moment White Lies. After watching their gig in Liverpool late last year, I thought that this was the kind of band who could step up to headline festivals shortly. After this performance, I am certain that they are just the kind of band who can do that. For one of the few times of the weekend, I saw a band who managed without cranking up the volume or tempo to sound perfectly suited to a space of that size. Each song is filled with drama, celebration and grandeur. One of their new songs even reminded me of the Whitney Houston classic I Wanna Dance With Somebody and I love that song. In fact, I’m sure that if a member of White Lies had a celebrity girlfriend or was in the gossip pages on a regular basis they would be headlining Glastonbury this year. It has been a while since I watched a set by The Jackobins, but given the improvement in the quality of their releases and the changes in band membership, there was no way I was going to miss their moment in the sun at Sound City. I have to say things have got considerably better to my taste. There is more bite to the band now, and it seems that lead members Dominic (singer) and Veso (guitar) have toned down a lot of their on-stage action which previously seemed like a U2 tribute act. Given that their bassist hardly moved, I have a feeling that the forced showmanship of the past was covering for fears in performance. Now the dancing, guitar hero’ing and general performing is entertaining and encouraging for you to join in the party. They’re constantly gigging, so get on down to watch them. I know Sound City took place at the end of May, but it might very well be that this summer becomes “The Summer of The Amazons“. With their debut album released on the Friday two days before, I was expecting some added excitement to their set. I did not expect to be faced with a tent that was full to the rafters for the last fifteen minutes of their soundcheck – which saw singalongs happen as each member of the band did their vocal checks with extracts of Junk Food Forever and In My Mind. As soon as the set started the atmosphere was electric, and after about fifteen seconds of audience shyness the moshpits opened up and The Amazons become fully aware that Liverpool Sound City loved them. After a couple of songs I thought it was only fair for me to leave so that someone else who hasn’t seen The Amazons several times over could take a bit of the set in. 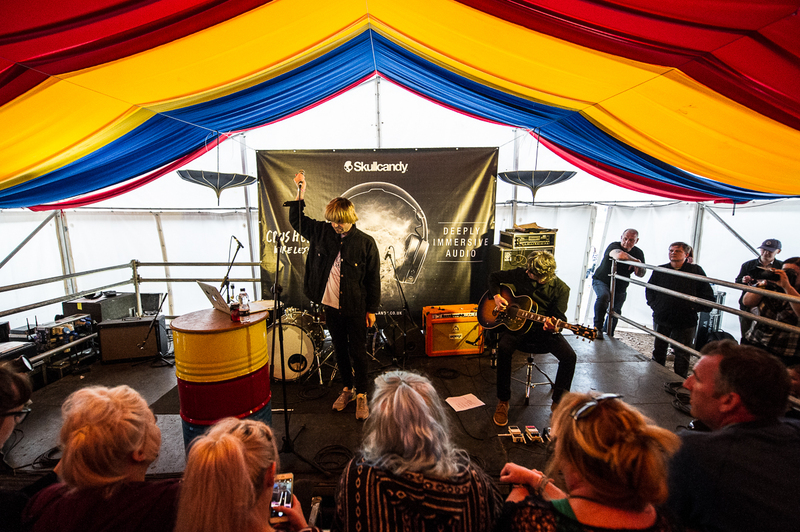 Celebrating the release of their 300th album, Tim Burgess and Mark Collins of The Charlatans performed a stripped back set in Tim Peaks Diner. Rumours had spread all weekend that it was going to be a full band set, but instead the simple settings suited the pairing. The acoustic version of North Country Boy will live with me forever as a beautiful version of one of my all-time favourite songs. Sadly though with a low stage and plenty of people crowding near the front, the setup felt a little bit too fragile for anybody who was beyond halfway of the moderate-sized tent. It says something though when Tim Burgess and Mark Collins were not the highlight on Tim’s own tent. For me, there was a choice of two. 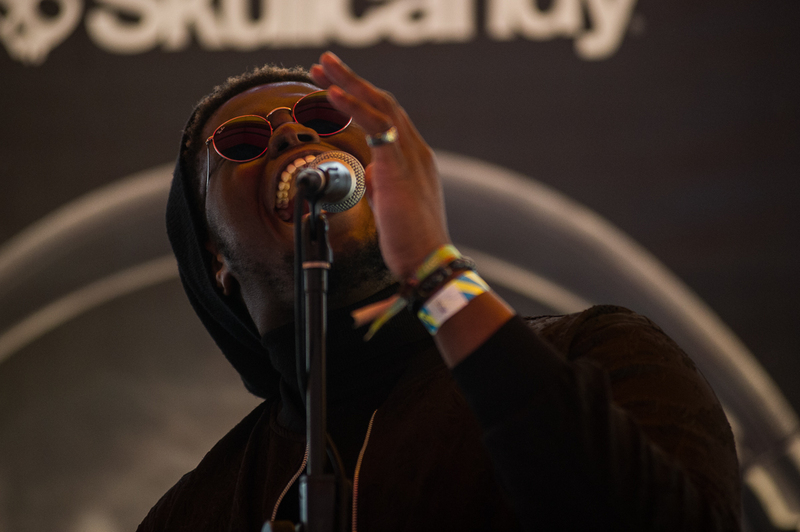 Firstly Xam Volo who stepped up from just being cool and sounding great, to making people dance, hold hands (it was too early for anything more despite it being proper seduction music), and let his guitarist loose with some impeccable solo work. I’m a big fan of Xam, and you can see more and more of his personality coming out in his shows. Let’s get a bit more funk to the sound and the world will start turning faster. The other standout moment was Tom Mouse Smith. When a little kid can keep a room quiet with only his voice and an acoustic guitar then you’ve got to take your hat off to him. The fact Tom did this without going into the realms of cutesy takes real skill. Whilst a cover of The House of The Rising Sun was a bit awkward for the more analytical members of the audience, Don’t Look Back in Anger brought cheers and a smile of victory from Tom’s dad which will have meant the world to the boy on stage. For the record, if it had gone cutesy and “Sound City’s Got Talent” I would have stormed out of there. Well done kid! The best thing about festivals, apart from the free love and hedonistic excess obviously, is the musical mixtape you make in your mind as you go from stage to stage. One of the best 30 minute periods I’ve stumbled across in ages was watching half of Fizzy Blood’s set which was the epitome of small stage hard rock. In fact, it felt almost sacrilegious that such riotous anger came forth from The Cavern Stage, Gerry would need a pacemaker for watching them. I almost needed a new hand as I slapped the barriers at the front of the stage in a completely ridiculous attempt of conveying the joy that was shooting through me. To save myself from any further damage, I decided to move away from the barrier and to the Pirate Studios stage. In a haze of smoke on stage, I saw a man leave his computer and keyboards to stand at the front of the stage to do a Big Fish, Little Fish dance. That was enough to grab my attention, but then the rest of the set of high quality beats from The Baltic States had me slinking and throwing my arms in the air in a manner entirely befitting of an indie kid who cannot dance in the slightest. The Baltic States play in a way that doesn’t have you looking to close your eyes and chill out, but still doesn’t need your heart to be racing at an artificial level to reach maximum enjoyment. You may notice that there is not much mentioned on Sound City as a festival. To me, Sound City this year was not a festival, and had quite a few failings and disappointments. However, I do not think it would be fair to review the bands with that negativity as it might come across as a criticism of some acts who did brilliantly with a bad hand, and some other bands who were just brilliant. Obviously though, I’ll be there again next year. It is Sound City after all. The hype beforehand may have been all about John Cale’s bananas, but it was Peaches that I’ll always remember.